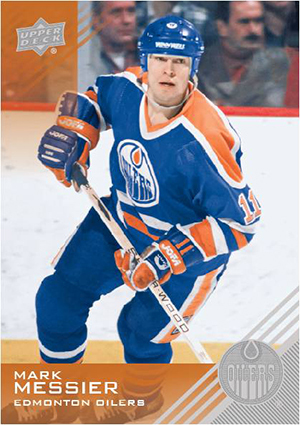 2013-14 Upper Deck Edmonton Oilers Collection takes on one of the most storied franchises in hockey history. The hockey card set covers the history of the team dating back to the dynasty years of the 1980s through to today's rising stars. Boxes include a full set as well as three autographs and a pair of manufactured patch cards. Wayne Gretzky, Mark Messier, Paul Coffey, Grant Fuhr, Jari Kurri, Paul Coffey -- these are just some of the greats to lace up for the Oilers. While there have been struggles in recent years, there's a core group of youngsters like Ryan Nugent-Hopkins, Taylor Hall, Jordan Eberle and Nail Yakupov with their sights set on bringing back the franchise glory. 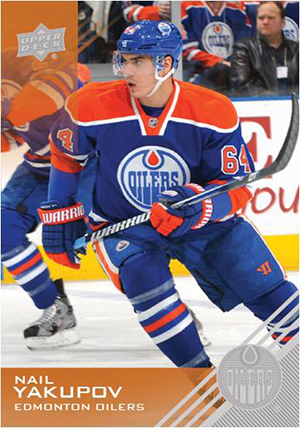 The 2013-14 Upper Deck Edmonton Oilers Collection base set has 90 cards. Although the product is packaged like a traditional hockey card product, sealed boxes do come with a full set. Boxes also have five Rainbow Foil parallels. 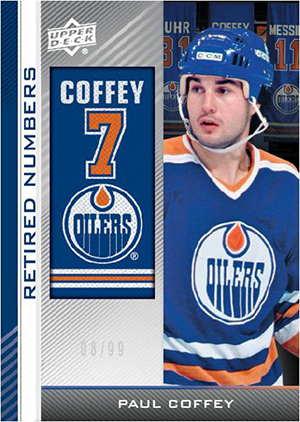 Although 2013-14 Upper Deck Edmonton Oilers Collection doesn't focus on game-used memorabilia, it does have two manufactured patch cards per box. Team Logos Patches follow a tiered system where some positions and themes are harder to get than others. This is a similar structure to the Team Logo Patch cards the company used in 2012-13 and 2013-14 O-Pee-Chee Hockey. Other patch sets include Championship Banners (#/99 or less), Monumental Franchise Emblems and Retired Numbers (#/99). The promised three autographs per box come in a variety of themes. Franchise Ink cards have anywhere from one to four signers. Other autographs include signed versions of Championship Banners (#/25 or less), Monumental Emblems and Retired Numbers (#/25 or less) manufactured patch cards. Randomly inserted are Masterpieces, one-of-one painted art cards. Looks good. 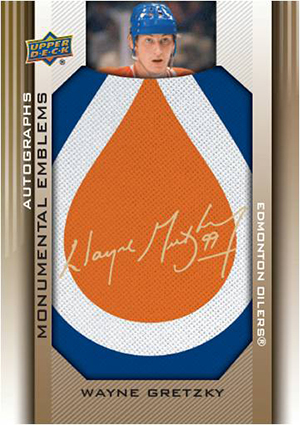 I’m not a huge Oilers fan, but I have a feeling this won’t be the only team set released this year ;). 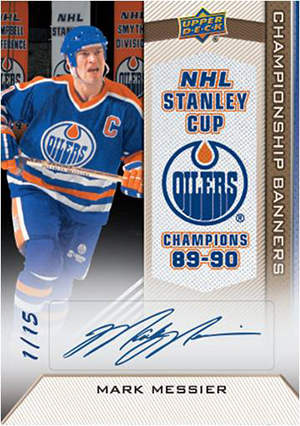 Since I am an Oiler and Gretzky fan I love this set. I do wish they would have more of the boys from the 80’s. Perhaps there could be a future update set. Broke a box that clearly states a complete base set and 3 autos in each box. Got plenty of doubles, nowhere near a complete base set and only one auto. Quality control was out to lunch. What a waste of money. Josh B � If the box was sealed, be sure to contact UD if you haven’t already. AWESOME SET!!! !Great for set building, or just buying a box or two. A nice pull from this set is the Gretzky /5 auto and of course the 1 of 1 Masterpieces. Great product and plenty of value. One of the best bang for your buck products. I’m not an Oilers fan but living in Edmonton decided to bust a few boxes, ended up doing 6 in total and sold the hits. Actually made money on 4 of the 6 boxes and made more then what I paid for the boxes, in total. which is very rare these days. Cards are nicely done and the banners are pretty cool looking cards.